“A clear–eyed musical concept in a natural collaborative flow, all beautifully articulated in the music and dance across Cover the Buckle. Acclaimed dance artist Kieran Jordan describes Cover The Buckle as set dance music designed for dance teachers and students, tune learners and tune listeners. It’s that, and more.” Read feature article in its entirety. In 2014, I asked Sean McComiskey and Seán Clohessy — two friends whose music, for years, has lifted my feet and my spirits — to work with me on a new CD of set dance music, designed for dance students and dance teachers, as well as tune learners and tune listeners. The guys agreed, and Cover the Buckle was born. 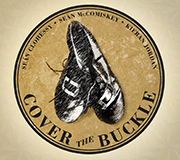 The term “cover the buckle” shows up in many historical descriptions of Irish dance, alluding to the name of a tune, the name of a dance, the name of a particular movement or step, and the overall display of step dancing itself. The buckle in question refers to the shiny silver buckles which adorned the shoes of the 18th and 19th century itinerant dance masters. An Irish “set dance” is both a tune and a dance — a musical composition, and a specific set of solo steps designed to match. This CD features well-known solo set dance tunes, like “The Garden of Daisies,” “The Blackbird,” “St. Patrick’s Day,” and more, plus a few unusual ones and personal favorites. The tunes are lively and energizing, played at dance-friendly tempos for traditional style step dancing. Each tune starts with a short intro and includes full AABB parts (for right and left foot repeats of the dancing). My own new choreography and percussive steps can be heard on a few tracks as well. With sublime playing from Seán Clohessy and Sean McComiskey and creative accompaniment from Josh Dukes and Matt Mulqueen, this CD breathes new life into the old tunes — shattering the sometimes-static ‘dance class’ approach and offering new possibilities for how these tunes feel, and how they might be danced.